When most people from other parts of the world think about New York City, they visualize Manhattan. But the Big Apple’s most populous borough, and one whose grittiness perhaps better represents the real spirit of New York, is Brooklyn. 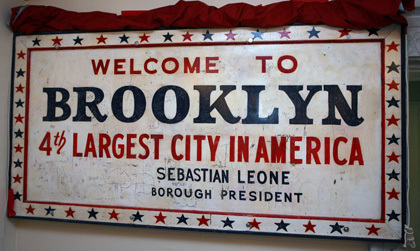 Indeed, if Brooklyn had not been consolidated into New York City in 1898 but had instead remained independent, it would, even today, remain the fourth largest city in the United States — just as depicted on the sign featured in the opening credits to Welcome Back Kotter. I enjoy spending time in Brooklyn; visiting Brooklyn Bridge Park, and strolling the boardwalk at Coney Island, are two of my very favorite things to do in this city. One thing that my forays into Brooklyn had never included, prior to Sunday night, was karaoke singing. In the over 16 years that I’ve been a New York City resident, I’ve sung in Manhattan on hundreds of different occasions; and I’ve also made multiple karaoke appearances in the borough of Queens. But Brooklyn had never witnessed an H-Bomb performance. Until now. 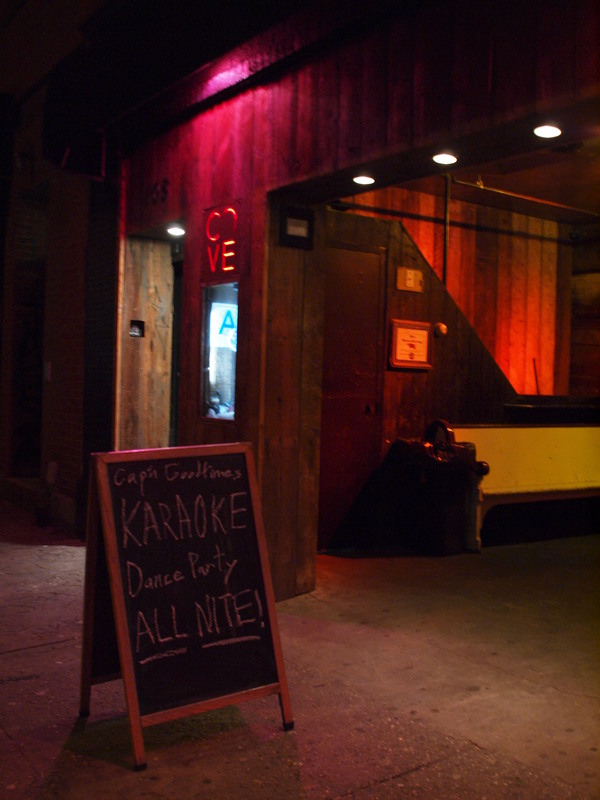 For a while, I’d been wanting to try out a particular karaoke show in Brooklyn’s hipsterish Williamsburg neighborhood, in a bar called The Cove. The KJ who runs that show calls himself Cap’n Goodtimes; his very name promises a fun evening. So what took me so long to make it out there? The problem was that the show is held only on Sunday nights, and I’d read that the starting time is 10:00 pm. That’s a difficult timeslot if you have to be at work on Monday morning — especially if, like me, you live uptown in Manhattan and face a long journey home from Brooklyn at the end of the night. This being a holiday weekend, however, my office was closed on Monday. So getting home late on this particular Sunday night would not present a problem for me. As a result, I finally checked out the Cap’n Goodtimes show. And almost from the moment of my arrival, I was asking myself why it had taken me so long to visit The Cove. Even as you first enter the bar, you know you’re in for a good time. A sandwich board on the sidewalk outside the front door promises an “all nite” dance party. And that’s no idle promise. This isn’t one of those karaoke bars where the patrons are oblivious to the singers on the stage. The folks at this show don’t just boringly sit at their tables all night. Audience members get out on the dance floor and use that floor for its intended purpose. 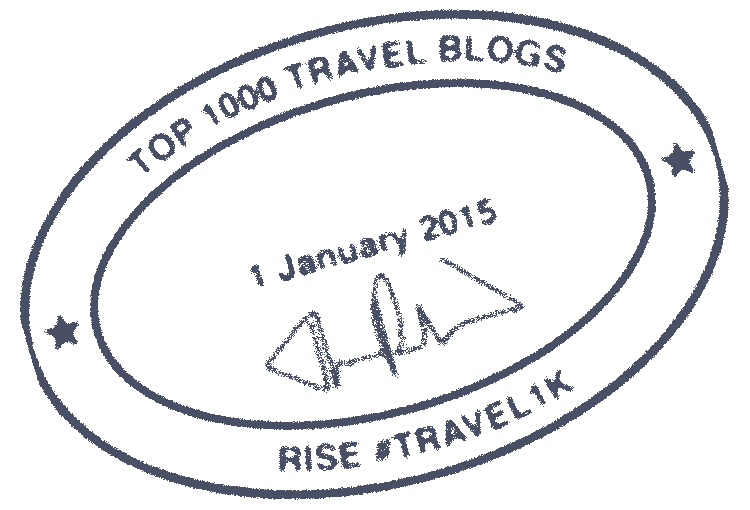 And if they like what they hear, they’re lavish with their praise for the performers. During my initial appearance at The Cove (yes, I said “initial”; I will most definitely be back! ), I sang a pair of songs: “True” by Spandau Ballet, and “La Bamba” by Los Lobos. Both are on my A-list, of course; I was going to take no chances when an entire borough was forming its first impression of my singing. 🙂 And the crowd showed me a lot of love. “La Bamba” in particular was a transcendent experience. The dance floor was jam-packed! And I fed off the enormous energy that the audience generated. When karaoke becomes that type of interactive event, it absolutely enhances my enjoyment of what I’m doing. By the way, it turned out that the Cap’n Goodtimes show that I attended this weekend had actually gotten underway at about 9 pm — earlier than the 10:00 starting time that I’d expected (although the Cap’n advised me that on a normal Sunday night, the place is pretty dead before 10:00 or so). And so, Brooklyn has become a long-overdue addition to my World Karaoke Tour (and I would say that I chose a pretty good show for that historic occasion). One of my Facebook friends asked how it is that I ended up singing in places like Africa before doing so in my neighboring borough. That one’s easy: checking off all five boroughs carries just a little less cachet for me than being able to say I’ve sung on six continents. 🙂 I mean, be honest with me: would you be reading this blog if it was called “H-Bomb’s Citywide Karaoke”? 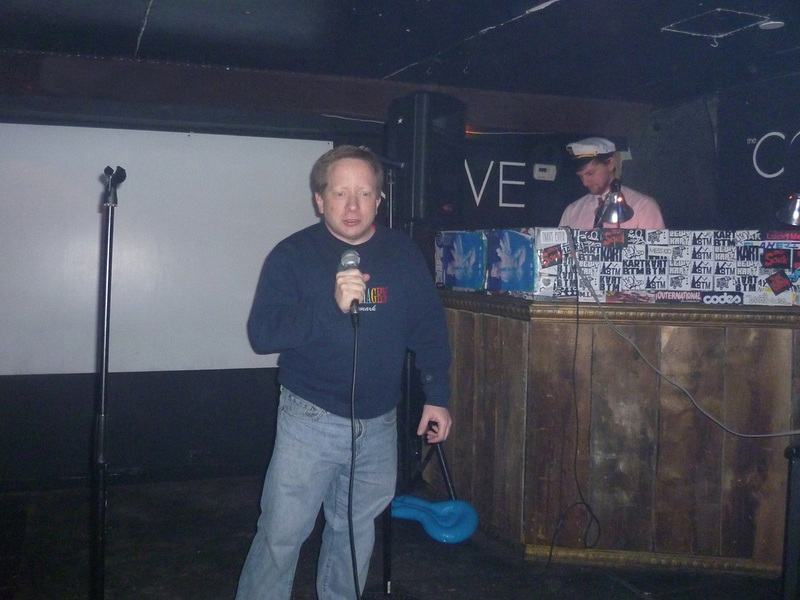 But now that I’ve made karaoke appearances in three boroughs, I have the other two in my sights. Hey Bronx and Staten Island, you’re next! And I look forward to more all-night karaoke dance parties in Brooklyn. 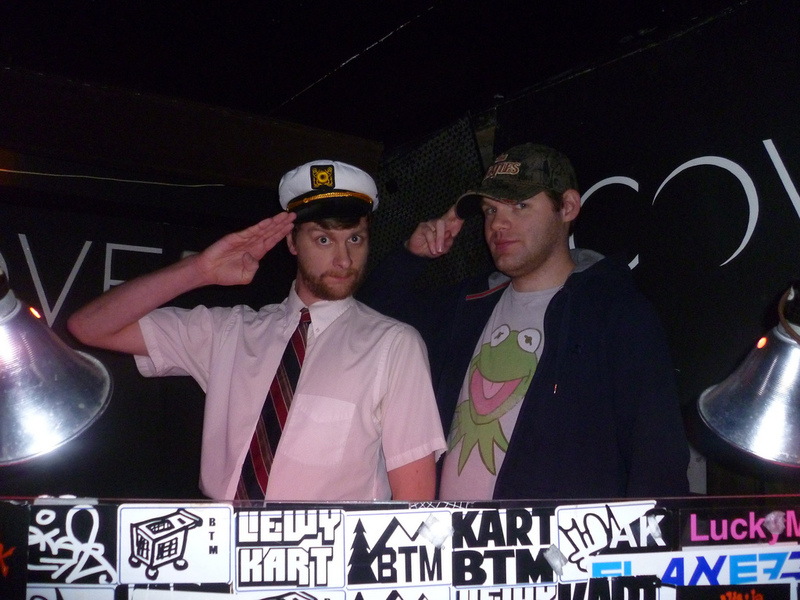 O Captain My Captain: Shown here is Christian Larson, a/k/a Cap'n Goodtimes, with his sidekick Todd.